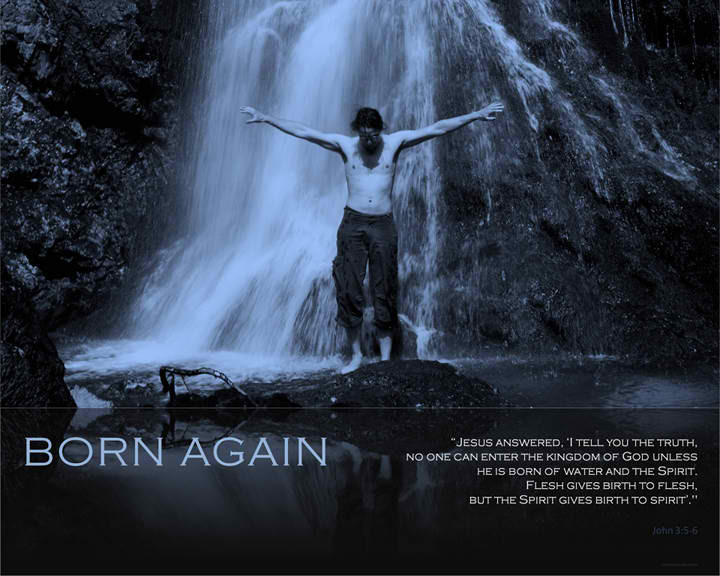 born again - Are You Ready for a Change? born again- from the Greek words gennao (born) annothen (again or from above); a "spiritual rebirth" (regeneration) of the human soul or spirit, contrasted with the physical birth. Jesus ' death and resurrection provide us with an intimate relationship with Jesus Christ as a new creation. We are dead to sin (flesh, self-effort or law) and alive in Christ (Spirit). We go from being "in Adam," under the law, to "in Christ," under grace. 2 Cor. 5:17 "Therefore if anyone is in Christ, he is a new creature, the old things passed away; behold, new things have come." There are 4 New Testament references to being born again in the NASB version (John 3:3, 3:7, 1 Peter 1:3, 1:23). All 4 verses are directed to Israel. John 3:3, "Jesus answered and said to him (Nicodemus), "Truly, truly, I say to you, unless one is born again he cannot see the kingdom of God." John 3:5-7, Jesus answered, 'Truly, truly, I say to you , unless one is born of water and the Spirit he cannot enter into the kingdom of God. That which is born of the flesh is flesh, and that which is born of the Spirit is spirit. Do not be amazed that I said to you, 'You must be born again.' "
Jesus is telling the Jews, they must be born again while He is still alive in the flesh. Notice in the two verses after the death and resurrection of Christ, Peter wrote that God's great mercy caused them to be born again and in the next verse uses the past tense, have been born again. 1 Peter 1:3 "Blessed be the God and Father of our Lord Jesus Christ, who according to His great mercy has caused us to be born again to a living hope through the resurrection of Jesus Christ from the dead,"
because as it is written, "YOU SHALL BE HOLY, FOR I AM HOLY." 1 Peter 1:23, "for you have been born again not of seed which is perishable but imperishable, that is, through the living and enduring word of God." Water baptism generally follows faith. Water baptism is a ceremony performed as an outward manifestation of your inward faith. Jesus did not baptize with water. He only baptized by the Spirit. Jesus was baptized by John the Baptist around the age of 30. Although water baptism is not required, it is an experience that allows the human mind to grasp the new creation concept and invites the Holy Spirit to transform the mind in the process. The picture that the mind creates from going under the water as the old self and emerging as the new self will be an experience the believer can draw from in the future. Luke 3:21-22, "Now when all the people were baptized, Jesus was also baptized, and while He was praying, heaven was opened, and the Holy Spirit descended upon Him in bodily form like a dove, and a voice came out of heaven, 'You are My beloved Son, in You I am well pleased.'" Galatians 3:24-27, "Therefore the Law has become our tutor to lead us to Christ, so that we may be justified by faith. But now that faith has come, we are no longer under a tutor. For you are all sons of God through faith in Christ Jesus. For all of you who were baptized into Christ have clothed yourselves with Christ." Acts 2:38, Peter said to them, "Repent (change your mind), and each of you be baptized in the name of Jesus Christ for the forgiveness of your sins; and you will receive the gift of the Holy Spirit." and that day there were added about three thousand souls." Christ is our life. Our identity is simply that we are in Christ. There are several family traits that you receive by being born into God's family and being placed into Christ. You are a saint. In 1 Corinthians 1:2, Paul refers to believers of the church at Corinth as saints. God looks at you as a saint. That is your new identity. You are a saint in Christ and no longer a sinner in Adam. This does not mean you live a sinless life, but that God has set you apart and placed the nature of Christ in you. You are righteous and holy. In Romans 5:17, Paul tells us that we have received the abundance of grace and the gift of righteousness. When Jesus died on the cross, our spirits were filled with righteousness. When we do not behave righteously, we are being inconsistent with who we really are. We have been born again with Christ 2000 years ago. It is the realization of the fact of who we are and what He did that begins the transformation process which renews our mind to this awesome reality reality. Links for more info on the new creation, and spiritual circumcision.